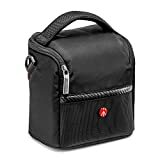 Advanced Shoulder bags are designed to carry all camera types and sizes: from CSC and super compact with large sensors all the way to full frame DSLRs, with additional lenses and their accessories (depending on size). These bags are a functional solution with enough space for essentials and a few small accessories such as batteries and memory cards. This entry was posted in Discount Photography and tagged Active, Camera, Manfrotto, Shoulder by Ball Photo. Bookmark the permalink.